tp24 currently deliver with Interlink Express allowing us to track orders and have items delivered within 2-3 days or if urgent 24 hours (feasibility of delivery and stock permitting). 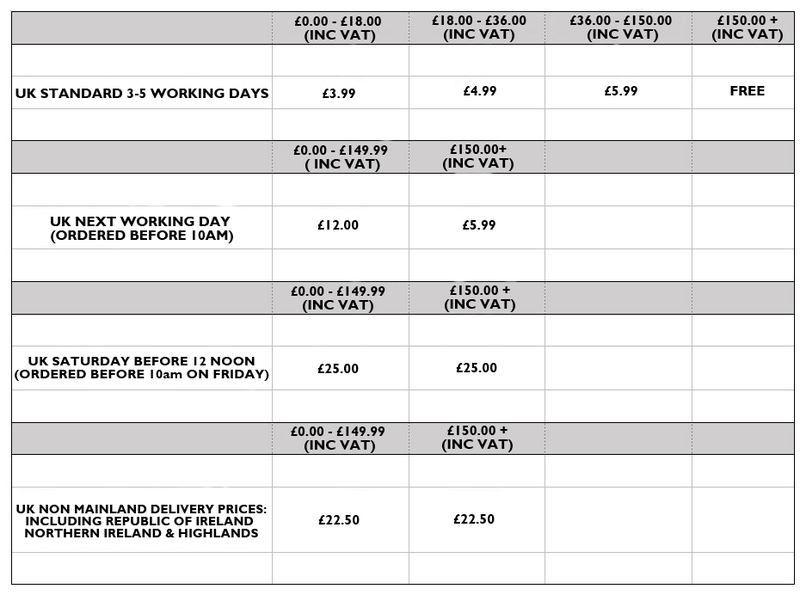 All delivery dates are approximate only and delivery will be arranged as soon as practicable. Out of stock items at the time of dispatch will be delivered as soon as they are available. After we have dispatched your order, Interlink will contact you via e-mail or text on the morning of your delivery to give you an estimated time of arrival. Any products that you order from us will be packaged in high quality cardboard cartons, all packed by hand to ensure that items reach you in perfect condition. My order has arrived but there’s a problem. Can you help me? Faulty goods can be returned to us at no cost to yourself. Please contact us via telephone or email and we will guide you through the simple process. Once goods have been returned and fully investigated and we confirm that they are faulty, we will refund you for the cost of mailing the product back to us. tp24 offer a full technical back-up service on all of our products, it’s all just a phone call away. Our excellent and efficient service puts you through to our own UK based in-house team of experienced, trained and knowledgeable staff members who are here to help. If you have ordered goods you are entitled to a full refund if you change your mind within 14 days of receiving the products. Please contact us via telephone or e-mail to arrange this. You will be responsible for the cost of returning the goods to us, and the products must be returned to us complete with its original packaging. You are responsible for ensuring the safe delivery of the returned products; we recommend that you use an insured delivery. See below for an explanation of the terms on our product detail pages that refer to stock availability. In stock: The item is available; we expect to prepare it for dispatch within a few hours to a few days. Temporarily out of stock: This item is currently not in stock but it is available for ordering. If you place an order the item will be delivered as soon as it becomes available. Currently unavailable: This item is currently not available for ordering, and we don’t know when or if this item will be in stock again. Here at tp24 we are 100% committed to protecting your security and privacy. We know that when you shop online, you want to know that your name, address, credit card details and any other information you give us is kept safe and secure. tp24’s complete commitment to customer service means we’ll make sure you, and only you, can access your account or view your financial details. For further information please visit our full terms & conditions for details.